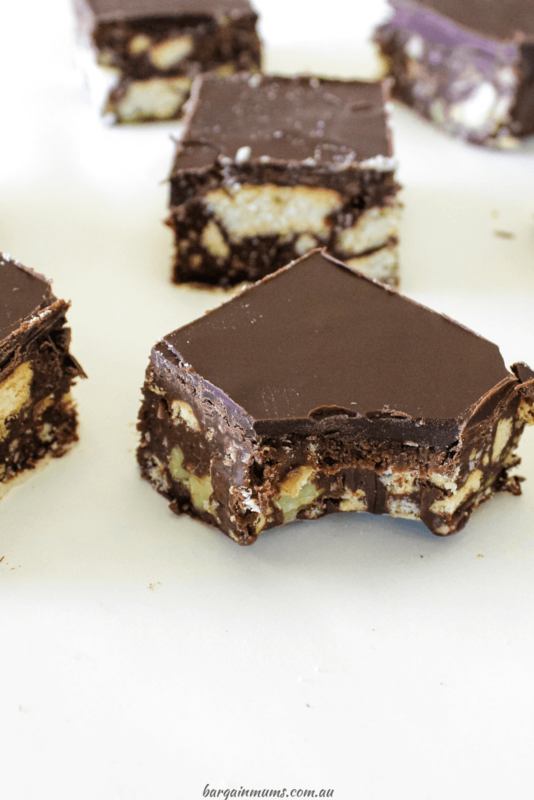 If you have tried chocolate hedgehog slice before, you are going to love this recipe. If you haven’t yet tried hedgehog slice, keep reading because you are in for a treat! With the perfect combination of chocolate, coconut, walnuts and biscuits, it’s hard stop at just one slice. It’s the perfect sweet treat that will leave you wanting more. I love making slices for those times I need to feed a crowd. Other favourite slices of mine would have to be Condensed Milk Berry Cheesecake Slice and White Chocolate Cheesecake Brownie Slice (can you tell I have a thing for cheesecake slices?). I loves slices so much I even created an easy slice recipe eBook. This slice is yet another slice to add to the ever growing list of easy slice recipes on my website. This particular slice is no-bake (my favourite kind), but is instead a quick and easy melt-and-mix style slice. Easy recipes are the best kind of recipes! Add oil to the chocolate top – Chocolate on it’s own is more likely to crack than chocolate with oil added when melted. The oil helps soften the chocolate that little bit, making it easier to cut through thin layer of chocolate. You can use vegetable oil, but I prefer to use coconut oil. From my own experience, oil works better than butter, as the butter tends to make the chocolate seize up a little, making the melted chocolate harder to spread. Leave the slice at room temperature for 10 minutes before slicing – Take the slice out of the fridge and leave it to sit at room temperature for around 10 minutes. This will allow the chocolate top time to soften slightly, which will make it much easier to slice. Sit the knife in hot water – Fill a large jug with hot water, and let the knife sit in it for a minute before cutting the slice. This will warm up the blade of the knife, make it slide through the chocolate without cracking it. How long does hedgehog slice last? Hedgehog slice will last up to 5 days in the fridge. Just store it in an airtight container in the fridge, and take pieces out as needed. Don’t have a food processor? They are great for crushing biscuits, but it’s still possible to crush biscuits without one. Place the biscuits in an appropriate sized zip lock bag and close the zip lock, removing any air from the bag as you do so. Lay the bag flat on a bench, then grab a rolling pin and bash the biscuits until the are crushed to your liking. Then simply remove the crushed biscuits from the zip lock bag and use according to the recipe directions. Before you make a start on this hedgehog slice, you will need to take a standard sized slice tin, and line it with baking paper. Set it aside for later. Once the slice tin it prepared, it’s time to make a start on the slice. The first step is to crush the biscuits, which can be done either by pulsing quickly in a food processor, or bashing the packet of biscuits a few times with a rolling pin (just be careful not to burst open the packet). For this recipe you will want most of the biscuits to still be in chunks, so don’t crush them too much. Add the slightly-crushed biscuits to a large mixing bowl along with the shredded coconut, cocoa powder and roughly chopped walnuts. Stir until well combined, and set aside while you set to work on the next step. Add the sweetened condensed milk, butter and dark chocolate to a microwave safe mixing bowl. Microwave in 30 second bursts, stirring well between each burst, until the chocolate and butter have melted and the mixture is smooth. Pour the chocolate mixture into the bowl with the biscuits mixture, and stir once again until well combined and everything is coated in the chocolate mixture. Transfer the hedgehog slice mixture to the prepared slice tin and push down with the back of a spoon to flatten as much as possible. Place in the fridge for around 30 minutes, or until set. Once the slice has set it’s time to make the chocolate top. Take a small microwave safe bowl and add the extra dark or milk chocolate and the coconut oil. Microwave in 30 second bursts, stirring well in between each burst, until the chocolate has melted and is smooth. Pour over the top of the slice, and place back in the fridge for around 10 minutes or until set. Once the slice has set, remove from the fridge, slice into small pieces and store in the fridge in an airtight container until ready to serve. 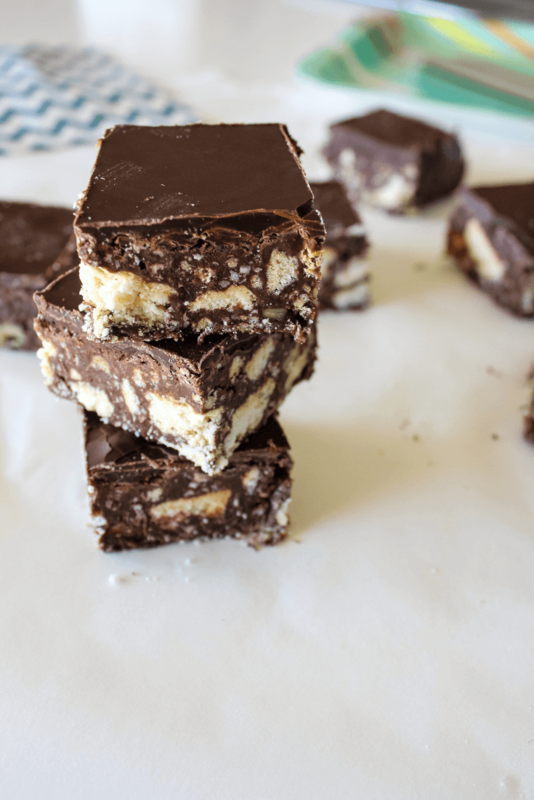 The best easy chocolate hedgehog slice recipe around. This recipe perfectly combines chocolate with the crunch of biscuit pieces and walnuts, along with a hint of coconut. Line a slice tin with baking paper. Set aside. Place the biscuits in food processor and process until some biscuits are crushed but there are still some chunks. Alternatively, gently bash the sealed packet of biscuits with a rolling pin, being careful not to burst the packet open. Add the biscuits to a large mixing bowl along with the shredded coconut, roughly chopped walnuts and cocoa powder. Mix well and set aside. Add the the sweetened condensed milk, dark chocolate and butter to a microwave safe mixing bowl. Microwave in 30 second bursts, stirring well in between each burst, until the chocolate and butter have melted. Stir until the chocolate mixture is smooth and well combined. Add the melted chocolate mixture to the bowl containing the biscuit mixture. Stir until well combined, then transfer the mixture to the prepared lined baking tray. Press the mixture as flat as possible, then place in the fridge for around 30 minutes or until set. Once the slice has set, add the extra dark or milk chocolate along with the coconut oil to a microwave safe mixing bowl, and microwave in 30 second bursts, stirring in between each, until the chocolate has melted and the mixture is smooth. Pour the melted chocolate over the slice and return to the fridge for around 10 minutes or until set. Slice and serve, storing any remaining hedgehog slice in the fridge.